Getting married is a big deal, which is why a lot of time, planning, and effort must go into making sure the day goes down as the fairytale you’ve always dreamed of. Some people get married in luxurious hotels, other on romantic ranches, and even some in the coziness of their home! While there’s absolutely nothing wrong with these approaches, and the planning of a wedding is an entirely personal process, surely some of us would like to channel our inner Prince Harry and Meghan Markle and get married in pure royalty. A plethora of stunning castles exist around the globe, across a variety of countries and continents—which castle you choose is entirely up to you. And who knows? If you fall in love with the venue, some of these castles are for sale too! This historic estate, located in Malbork, Poland, is a 13th-century Teutonic castle and fortress, and is the largest castle in the world according to the UNESCO World Heritage! Originally, the castle was constructed by the Teutonic Knights, a German Roman Catholic group of crusaders. In 1466, during the division of Prussia into eastern and western parts, the castle and town became part of western Royal Prussia. It was once the residence of Polish royalty. The castle is a classic example of a medieval fortress, and earned the title of one of Poland’s official national Historic Monuments, as designated on September 1994. Since the 19th century and onwards, the castle has seen various restoration efforts, and also doubles as a museum nowadays! Looking to host a wedding here? The castle offers gorgeous ballrooms that are definitely suitable for the occasion in size, architecture and decor. Most notably, the Great Refectory room used to host the guests of knights. It’s the largest hall in the castle, with 14 large arched windows, wonderfully raw ornamentation and spectacular palm vaulting held by three slender columns. 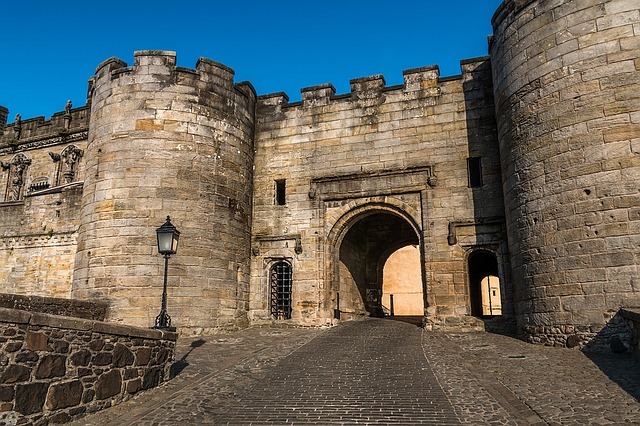 Touting the title as one of Scotland’s largest castles, this centuries-old structure exudes charm and royalty, making it the perfect venue to host your wedding. The Castle is nestled upon Castle Hill, secluded from the rest of the world. Matter of fact, given the castle is surrounded on three sides by steep cliffs, this attributed to a strong defensive position, especially utilized in earlier times. Most of the principal buildings of the castle date back to the fifteenth and sixteenth centuries, with some structures from the fourteenth century still remaining! The castle was known for housing Scottish royals, with several Scottish Kings and Queens having been crowned at Stirling, notably including Mary, Queen of Scots, in 1542. Further, knights, nobles and foreign ambassadors once flocked to Stirling Castle to revel in its unparalleled grandeur. So if saying your “I dos” in this fortress doesn’t make you feel like royalty, I’m not sure what will! For your wedding, the staff at Stirling Castle is more than willing to make your dream day come true. You have the choice of three, picturesque venues: Chapel Royal, a spectacular setting for your wedding, complete with a grand entrance and an interior decorated with painted frieze, dating from 1628, the Great Hall, a beautifully restored 16th-century Great Hall, one of Scotland’s most prestigious venues, the Queen Anne Garden, for those who want a romantic summer wedding, and Argyll’s Lodging, a gorgeous Renaissance townhouse. Get married in a castle steeped with Italian beauty, located in the town of Bracciano, outside of Rome, sitting upon the shores of volcanic Lake Bracciano. Enjoy picture-perfect sights of the Mediterranean, capturing pictures that’ll surely last a lifetime. The castle presents a reputation for the largest and most well-maintained castle in Italy, and also houses a museum as a center for cultural events. The castle’s earliest history is inferred to be linked to one of the numerous towers built in the tenth century as defense against the Saracen attacks. Aesthetically, the castle includes a plethora of enchanting gardens, perfect for an intimate ceremony or a large gathering of up to 1,000 participants. Further, the castle’s unique, versatile outdoor venues and indoor rooms can easily be adapted to host all kinds of events. Need help putting together your wedding? The castle also offers a staff more than willing to aid in preparations. Additionally, the castle has hosted several high-profile weddings such as Tom Cruise and Katie Holmes, Eros Ramazzotti and Michelle Hunziker, and Petra Ecclestone and James Stunt.